This post is the second in a series I’ll be writing this week catching up on documenting projects I worked on this semester. The ITP semester goes by like a steam-powered locomotive and good documentation is frequently the first thing thrown under the wheels. This week, I intend to pull some of my projects out from under that rushing train by writing them up here. 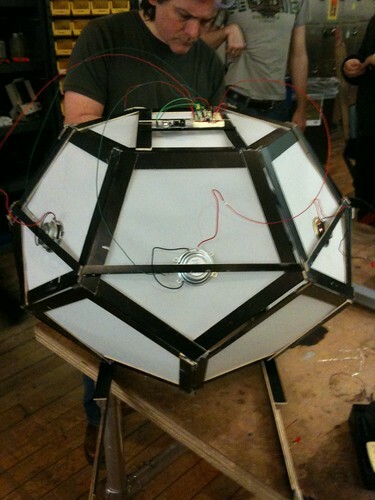 Some of the most surprising projects at ITP arise out of collaboration. When you work with someone with a different background and a different set of interests than your own you frequently end up making work that neither of you would have conceived alone. A great example of that for me this semester was the project Morgen Fleisig and I built for Living Art in response to an assignment about symmetry. Morgen is a practicing architect and somehow whenever we work together we end up exploring the relationship between music and built space. For example, he and I worked together earlier this semester to compose a set of rules for a group of people to perform a piece of music that would transform based on the space in which it was performed: Instructions for Indoor Music. For the symmetry assignment, Morgen and I decided to explore ways of expressing a single symmetrical pattern in both musical and spatial form. 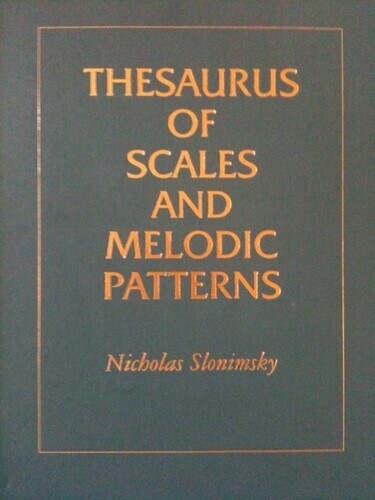 We started with a scale from Slonimsky’s Thesaurus of Scales and Melodic Patterns. Slonimsky’s Thesaurus is a monument from the era of Modernism in music when composers explored the formal and mathematical relationships inherent in the tempered scale and the intervalic relationships that constitute it. It achieved wider fame later on when John Coltrane professed its importance in developing his “sheets of sound” style (see the wikipedia entry on the Coltrane Changes for more info). The Thesaurus proceeds systematically through every possible equal sub-division of the octave to define a series of scales and then explores a set of patterns and arpeggiations on those scales. Put another way, Slonimsky provides an exhaustive exploration of the mathematical patterns and symmetries within the tempered scale beyond the traditional major, minor, and other modes. A Hexagonal Truncated Trapezohedron is the spatial equivalent of the whole tone scale because it divides the full 360 degrees of the circle into six equal parts, just as the whole tone scale does the octave. Looked at from the point of view of the Whole Tone Progression, the Trapezohedron provides a number of affordances: you could map the six tones of the scale to each of the pentagons on either layer in a number of different configurations. 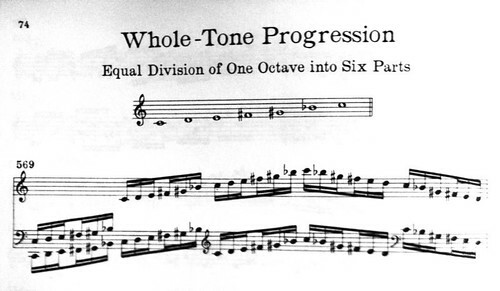 In addition to the scales themselves, Slonimsky provides a set of patterns and sequences to explore those scales. 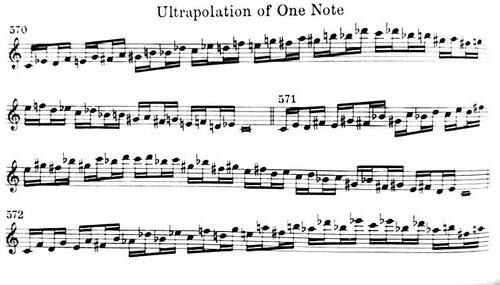 For each progression, the sequences start simple and get more complicated—moving from Ultrapolation of One Note through Infrapolation of One Note to Infra-Interpolation and eventually all the way to Infra-Inter-Ultrapolation. Once we had chosen the pattern, we then started working on turning it into a structure and bringing the pattern to life with speakers and LEDs. I took on the electronics and Morgen took on the structure. Simultaneously, Morgen was working on the structure. After some discussion, we decided that it should be a helmet. Helmets are an efficient way of creating internal spaces that can be inhabited by one person at a time without having to build a whole room. We ended up arranging the speakers symmetrically around the helmet in pairs so that the musical sequence would move around your head without the stereo image changing. We also covered each surface of the helmet with vellum to diffuse the LED indicating the active panels. 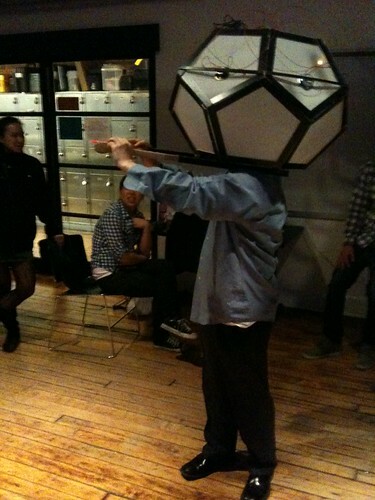 Here are a couple of videos of people in the class wearing the helmet in its final form. The real joy of the final piece for me was watching people wear it. It ended up turning them into 1950s robots from Planet Modernism in a way that embodied both the techno-seriousness and the ridiculousness of modernist music. You can see more images of it on my flickr set about the project: Whole Tone Ultrapolation on a Hexagonal Truncated Trapezohedron.